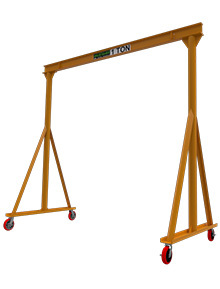 Designed for everyday use, gantry cranes are recommended for production, installation, and maintenance service where portability is required. Depending on the capacity, the gantry is equipped with phenolic, poly coated, or forged steel heavy duty swivel casters. All caster types feature roller bearings for ease of movement and grease fittings are included for ease of maintenance. ‘V’ Groove and flanged wheels are also available upon request. • Rated loads from 1/8 to 10 ton with span lengths up to 30+ feet.